This spacious lakefront log home is perfect for your family get-away. The cabin sleeps 14 and features two large family rooms with plenty of space to play games, watch movies, and spend quality time together. 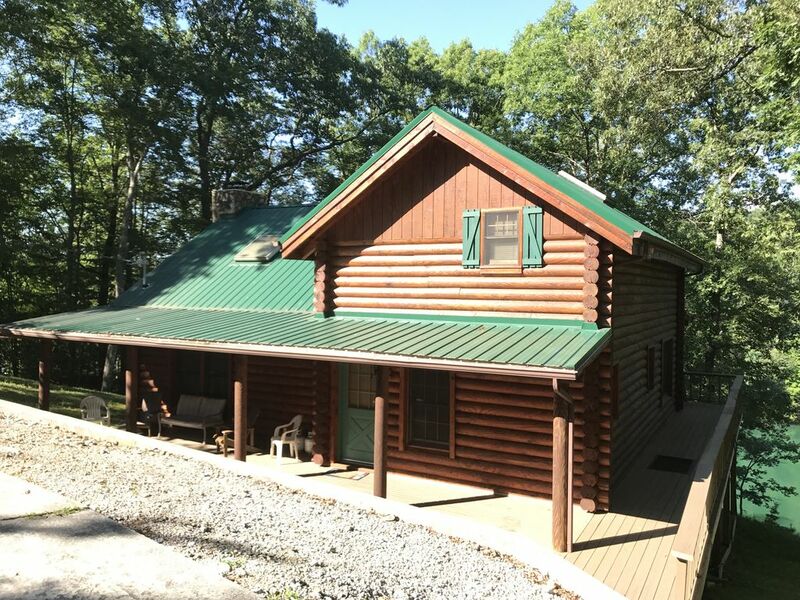 It has 3 bedrooms and 2 1/2 baths and features lots of windows to view the blue-green waters of beautiful Norris Lake from almost any room in the house. The location on the water is great & on a quiet part of Norris Lake in the Big Creek Area between Whitman Hollow and Sequoyah Marinas. The Lakefront Lodge features new stainless steel appliances, fully equipped kitchen, 26 lb per day ice maker, large bedrooms, family room w/foosball, and first-level living room. Access the two-level spacious decking overlooking Norris lake through either the living room or family room. It is minutes away from Whitman Hollow, Sequoyah Marina, and Shanghai Resort. Don't worry about the security of your boat trailer at a boat launch since there is plenty of on-site parking for boat trailers and vehicles. The top has 1 master bedroom with queen bed, full sleeper sofa and full bath with jacuzzi tub. The middle (main) has a living room, kitchen, dining room with table seating for 6 plus 2 more at the kitchen counter and 1/2 bath. The spacious living room offers a flat panel LED TV and two full size couches, recliner, and bay window for additional seating. The lower has 2 bedrooms. One with a full bed and a set of bunk beds and the other has full over full bunk beds and a full bath between with washer and dryer. Also has a family room with LED TV and foosball table which leads out to a large deck overlooking beautiful Norris Lake. The family room has a full size sleeper sofa in the leather sectional couch. Outside, enjoy gathering with family & friends while grilling out on the gas grill or playing corn hole. There is plenty of eating & gathering space outside on the lower deck, or enjoy eating at the upper level 'high-top' area while overlooking the water. During the day, spend time boating on the clear, glass-like water of Big Creek or just relax and have fun swimming or hanging out at the private covered dock with giant swim platform and picnic tables...in the back of a quiet deep-water cove, there's no need to worry about wake from boats cruising by at high speed. Float in the lake or take the paddle boat out for a cruise and look for many of the turtles, heron, or beavers that live in the cove. Fishing off a paddle boat is great too - it gives you access to many more spots on the water than you could fit a boat. In the evenings, enjoy eating S'mores around the campfire at the large fire pit. Take the steps or walk the concrete path using the available pull-cart down to the new Private Wahoo dock with 26' deep covered single slip, swim platform, & gangway with rails. A giant 30' x 16' (480 sq ft) steel platform dock was added in 2017. This swim platform has multiple picnic tables and seating for relaxing and fishing in the back of the cove. All docks have composite decking so no need to worry about splinters in little feet. Please note: like many houses at Norris lake, there are steps to the water. Taking the path will only leave 20-30 steps depending on the water level. If you have a larger group, consider renting nearby homes as well as The Lakefront Lodge. "Tranquility Point" - also listed on VRBO (#506326) is about 400 yards away and a separate log cabin (VRBO #504754) is across the cove. We live in Dayton, OH and have rented houses and floating houses at Norris Lake with family and friends for approximately 15 years. We purchased this cabin in 2014 and have worked hard to furnish with amenities we looked for as renters. I think you'll find the Lakefront Lodge fully furnished with everything you'll need for a great vacation. We know your family and friends will enjoy being at the Lake Front Lodge as much as we do - it's perfect for that relaxing get-away. The Lake Front lodge is in the perfect location on Big Creek. After many years renting near Springs and Flat Hollow, we tried the Big Creek area and fell in love. Big Creek has it all...calm water for watersports, great fishing, and close enough to the large marinas for nightlife. If you're looking for relaxation, we enjoy sitting on the back porch swing looking out over the cove - it's perfect! After looking at many homes for several years, we fell in love with the Lake Front Lodge due to the large kitchen and family rooms for gatherings. When vacationing in the mountains, staying in a log cabin adds to the vacation experience. We will definitely be back! The owner was wonderful to work with which is very important. The cabin was amazing... very spacious. The cabin is located back on a cove which was fantastic because you could swim off the dock with no worries about boats flying through. The climb up and down to the dock had several stairs or you could walk the ramp. You really can't get away from steps up and down to the dock when you're staying lakefront on any property in the mountains:) Our large family totally enjoyed staying at this property! Great house for weekend get away! Great outdoor space! Loved the large decks and dock area. House is tucked back in a deep water cove away from boat traffic. Great for swimming after a day on the water. Inside is spacious and has plenty of room for a large group. No internet or cable would be my only knock on this place. We're glad our property fit your needs and would love to have you back again. Although due to our rural location, internet service is limited we recently installed ViaSat Satellite-based internet. While not equivalent to cable, fiber optic, or DSL, this internet service should allow web browsing, email, text at a minimum. Great place to stay with a couple families! This place is in a great location-close to marinas, yet tucked back in a quiet cove. The cabin has pretty much anything you could want/need. The new dock is awesome! We will definitely stay again in the future!! We look forward to having you as a guest again soon and we agree...it's a great place for families. Our kids start to look forward to the next trip with their friends about the time we head back from the previous trip! Great place, great location, very accommodating. This was a great place to stay. The property was accurately described and we were very pleased. We will definitely be interested in coming back. What a great place to share good times with great friends! Our entire group spent every waking moment enjoying all the outdoor living spaces. The dock was everyone's favorite and was plenty big for 2 boats and on the end of a quiet cove that was fun to swim in. The cabin was a great setting for kiddos to unwind watching movies together while the parents got their own space to relax and chat out on the decks or in the kitchen. We had an epic vacation at this cabin. Can't wait until next time. It's terrific to hear you had a great time on your trip and we hope to have you back again soon! We had a terrific time!